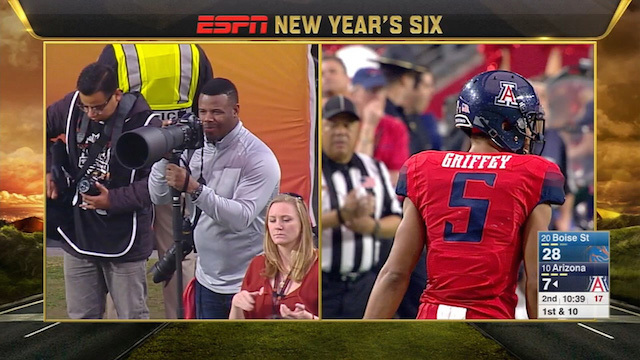 Ken Griffey Jr. didn't just watch his son Trey play in the Fiesta Bowl Wednesday night. He photographed the game, too. That man above with the professional looking camera set up on the sidelines of the Fiesta Bowl is not a stringer for the Associated Press or Getty Images. It's Ken Griffey Jr. Because, of course. Griffey didn't just watch the game from the sidelines Wednesday night - he photographed it for ESPN. Griffey has taken a shine to photography since his retirement from the big leagues. His new hobby afforded him the opportunity to watch his son, Arizona wide receiver Trey Griffey, both in the flesh and from behind the lens. Arizona eventually lost to Boise State, 38-30. No word yet on whether all of Griffey's shots were of Trey, or just some of them. Look at the size of that lens, though! This isn't Griffey's first time hitting it big with a hobby outside of baseball. One must not forget his illustrious rap debut.